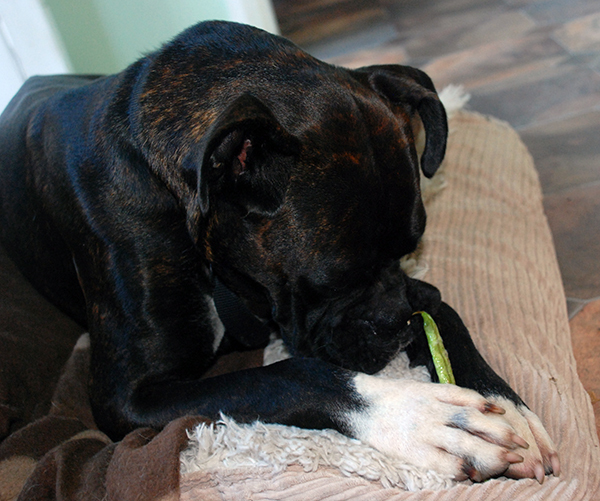 A boxer enjoying a green bean treat! The pair found great fun in chewing open the pods and gnawing on the beans inside. They were even happy to share, each chewing on one end of the same pod... hmmm.... reminds me of a disney film. Fresh vegies are an important part of a dogs diet. The inclusion of vegetables, grains and fruits in their diet mimics what would naturally be consumed from the stomach of their prey (just picture your dog as a wild wolf roaming the hills, a healthy diet should mimic that of their wild ancestors). I can't think of a better way to make sure they get their vegies than to offer a green bean treat! Try green beans with your dog, I found mine preferred his semi dried, but still chewable.